Janet earned her Bachelor of Fine Arts degree from The Cooper Union School of Art, NYC. She began her career illustrating books for Macmillan and Random House. She went on to have a successful career in design and advertising in NYC and Boston. 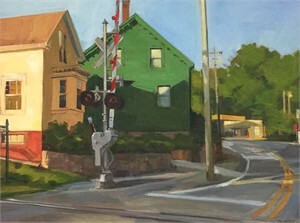 She currently lives on the north shore of Massachusetts with her husband, and fellow artist, Mike Dorsey. She is a juried member of the North Shore Arts Association and the Rockport Art Associatio & Museum, as well as a member of the Newburyport Art Association. Her oil and watercolor landscapes are in the collection of both U.S. and European art buyers. Janet Sutherland Janet earned her Bachelor of Fine Arts degree from The Cooper Union School of Art, NYC. She began her career illustrating books for Macmillan and Random House. She went on to have a successful career in design and advertising in NYC and Boston. She currently lives on the north shore of Massachusetts with her husband, and fellow artist, Mike Dorsey. She is a juried member of the North Shore Arts Association and the Rockport Art Associatio & Museum, as well as a member of the Newburyport Art Association. Her oil and watercolor landscapes are in the collection of both U.S. and European art buyers.